It's finally happened. 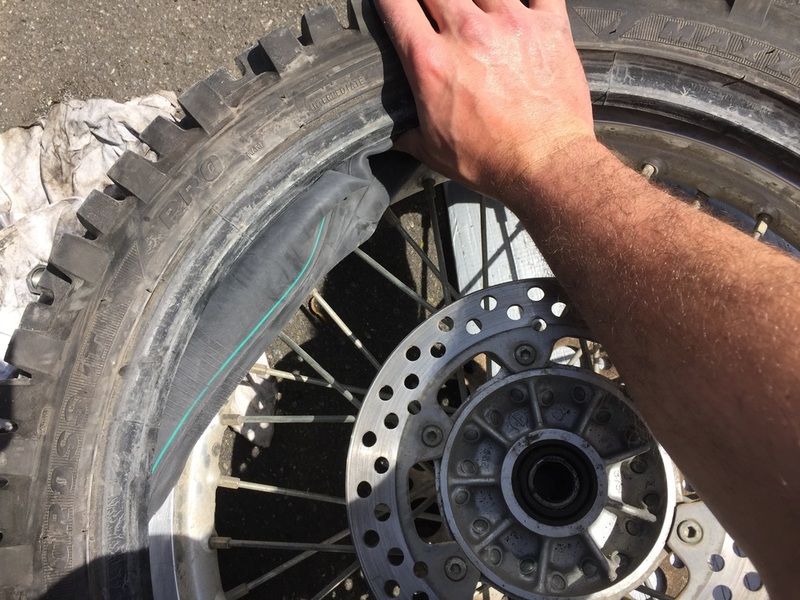 I've had my first puncture on my DRZ the other day. Unfortunately I had no repair kit on me but managed to get a pick from some friends to get me back home. I know I won't be able to do this when I'm in Mongolia or wherever so now is a great time to learn how to do this fix. I went straight on to YouTube and started watching some how to videos. There is a wealth of information and such great help it was. I will tell you now, I'm no mechanic, so if you're reading this and thinking 'That's easy! ', then good for you. I'm trying to learn in time for my trip next year. So this is how I did it. First off, get the bike stable. 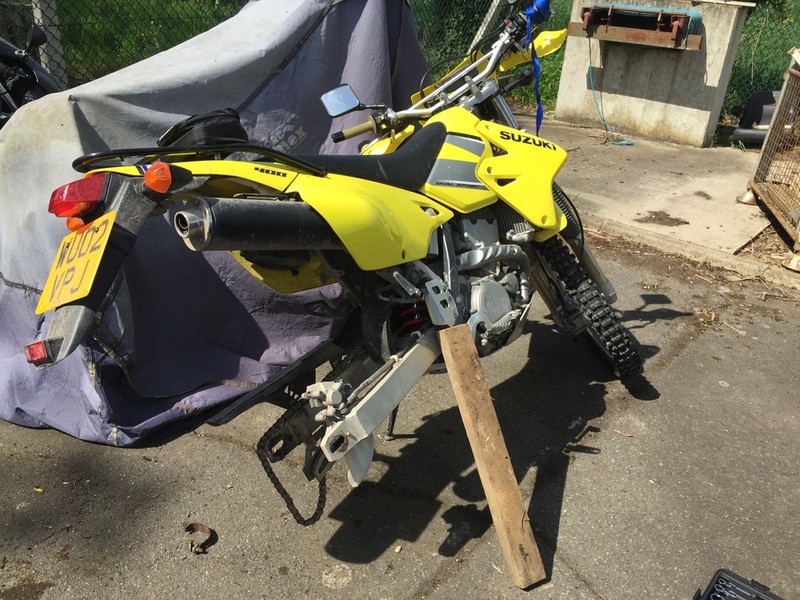 This bike doesn't come with a centre stand so as you can see I've improvised with a block of wood and propped it up. 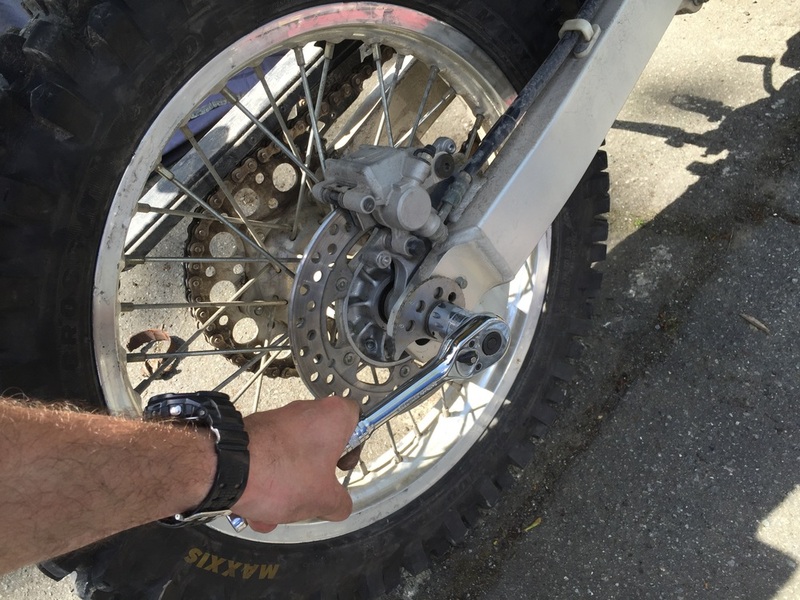 Make sure too that you hold down the front brake with a strap or something similar. This will prevent the bike from moving when you come to taking the wheel off. Next up, getting the wheel off. Like with wheel changes on a car it's much easier if you crack the nut off with the bike still on the ground. Take the nut and all the washers off the axle on the right hand side then pull the axle out from the left. Ensure you place them all onto to a clean rag to keep it clean and free from grit on the ground. Now that's all off you can take the wheel off the bike. Be careful with the brake unit in that you don't damage anything. The wheel should easily slide out. Place the wheel on a protective pad so it's not on the ground. I used my body weight to break the bead. This is just getting the tyre away from the rim. Once done flip it over and do the other side too. This will make it a lot easier to get the tube out in a bit. Now the sweaty part. Place the wheel on the mat with the disc uppermost. Your knuckles will thank you for it. Undo the nut of the valve of the tube. Take one of your tyre levers and place it into the base of the tyre and lever it out over the rim. This can be really tough. I used some warm soapy water to lubricate the tyre to help ease over the rim. Next up, use the second tyre lever and do the same. Keep the gaps real small to start with between the tyre levers. Makes it so much easier. Trust me! Once it's off the rim you can now take the tube out. Either patch it up or put a new one in. For me a new one was needed as the base of the valve had split. Get the new tube and place it inside on the rim. If you put a little air inside it makes it easier. This will also prevent the tube from twisting inside the tyre as you fully pump it up later on. Make sure you do the valve nut up. Now lubriacte the tyre again with soapy water or whatever else you got and get the tyre levers out again. 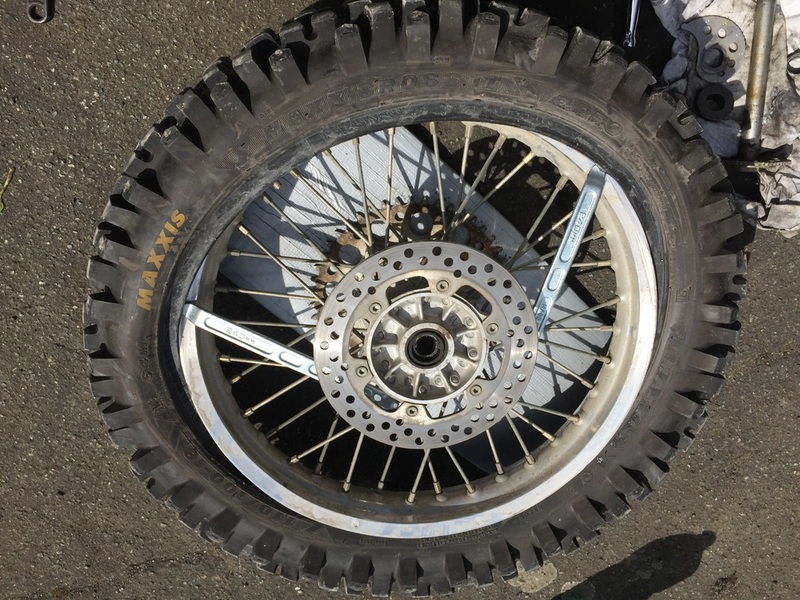 This time you will do the opposite from before and get the tyre over the rim. Be careful not to pinch the tube on the inside. Now the tyre is fully on it's time to inflate it to the desired psi. That's it! You are finished. Only thing left to do is get the wheel back on the bike. Easy stuff. Before you put the tyre back on use this opportunity to inspect and clean the bearings and the axel. Put some fresh grease on and replace any parts that looks damaged.